Renwick's monument stands at the west end of the village, on a low eminence. 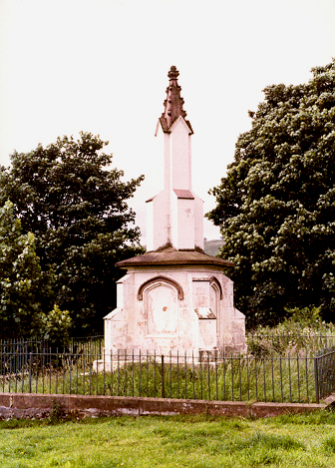 James Renwick was born near to this monument on 15 February 1662, the son of Andrew and Elizabeth. He attended Edinburgh University and subsequently studied for the inistry in Holland. On 23 November 1683 he preached his first sermon for the Covenanters at Darmead in Lanarkshire. In 1685 he was responsible for the second Sanquhar Declaration. He was imprsioned in Edinburgh and sentenced to hanging in the city on 17 February 1688. He was the last Covenanter to face public execution (George Wood was shot in the fields a few days later).